The midwest flower angel team created 100 corsages for the Mothers Day Brunch we are supporting. Thank You Lori Garbe and your wonderful donation to Freedom Petals. Happy Spring to the Freedom Petals family. We have had a very successful March, with two beautiful flower events. First was the Aleethia Dinner at the Rock Creek Manor house in Bethesda Maryland. The Friday team created 12 St. Patrick's Day arrangements and a special birthday arrangement for a special service members wife. The trip to Walter Reed National Military Medical Center was the most touching delivery we have ever had. It just gets better and better with every delivery. The flowers were fresh and colorful this month. Joan and I were asked to stay in two wounded warriors rooms and sit and talk with them and their families. And luckily we were not in any rush and could oblige. I can't tell you how rewarding that was to both of us. Joan's son served in Iraq on two deployments and I could tell this meant so much to her. We will be skipping April this year, but will focus on Mother's Day weekend with three events. We will have a very large challenge to make 80 corsages for the Wounded Warrior Cafe at Building 62 on the Walter Reed campus. They are holding a Mother's Day brunch and asked us to support this effort with flowers. 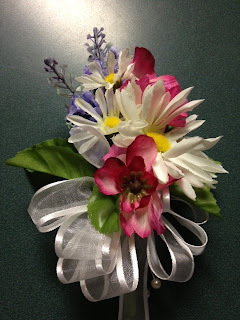 I will be asking volunteers to pre-make the bows for the corsages in their home that week. We will also be creating flower arrangements for the Friday night Aleethia Dinner and perhaps God willing make a hospital delivery as well. All depends on the amount of flowers we can collect.